Western blot analysis of NFAT2 using anti-NFAT2 antibody . Electrophoresis was performed on a 5-20% SDS-PAGE gel at 70V (Stacking gel) / 90V (Resolving gel) for 2-3 hours. The sample well of each Lane was loaded with 50ug of sample under reducing conditions. Lane 1: mouse thymus tissue lysates, Lane 2: human 22RV1 whole cell lysates. After Electrophoresis, proteins were transferred to a Nitrocellulose membrane at 150mA for 50-90 minutes. Blocked the membrane with 5% Non-fat Milk/ TBS for 1.5 hour at RT. 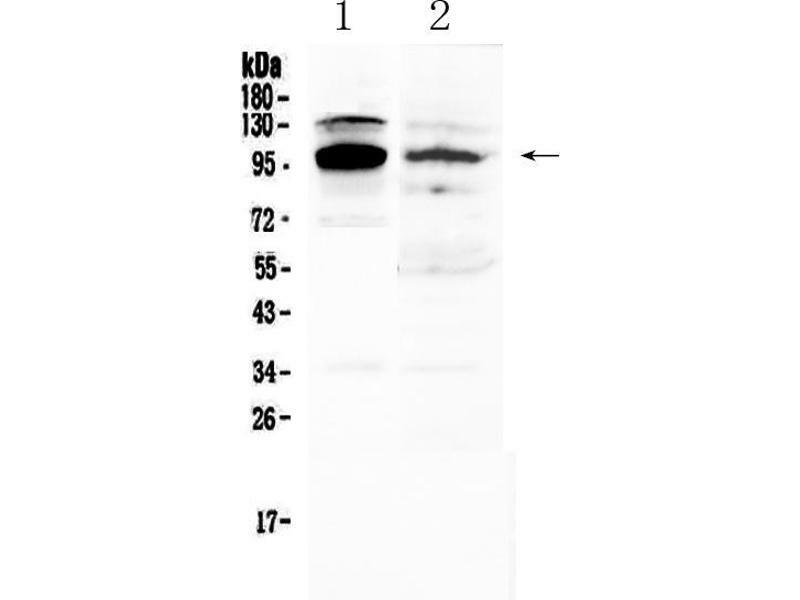 The membrane was incubated with rabbit anti-NFAT2 antigen affinity purified polyclonal antibody (Catalog # ) at 0.5 ug/mL overnight at 4â„ƒ, then washed with TBS-0.1%Tween 3 times with 5 minutes each and probed with a goat anti-rabbit IgG-HRP secondary antibody at a dilution of 1:10000 for 1.5 hour at RT. The signal is developed using an Enhanced Chemiluminescent detection (ECL) kit (Catalog # EK1002) with Tanon 5200 system. A specific band was detected for NFAT2 at approximately 101KD. The expected band size for NFAT2 is at 101KD. Flow Cytometry analysis of Hela cells using anti-NFATC1 antibody . Overlay histogram showing Hela cells stained with (Blue line).The cells were blocked with 10% normal goat serum. And then incubated with rabbit anti-NFATC1 Antibody (,1µg/1x106 cells) for 30 min at 20°C. DyLight®488 conjugated goat anti-rabbit IgG (BA1127, 5-10µg/1x106 cells) was used as secondary antibody for 30 minutes at 20°C. Isotype control antibody (Green line) was rabbit IgG (1µg/1x106) used under the same conditions. Unlabelled sample (Red line) was also used as a control. Flow Cytometry analysis of THP-1 cells using anti-NFATC1 antibody . Overlay histogram showing THP-1 cells stained with (Blue line).The cells were blocked with 10% normal goat serum. And then incubated with rabbit anti-NFATC1 Antibody (,1µg/1x106 cells) for 30 min at 20°C. DyLight®488 conjugated goat anti-rabbit IgG (BA1127, 5-10µg/1x106 cells) was used as secondary antibody for 30 minutes at 20°C. Isotype control antibody (Green line) was rabbit IgG (1µg/1x106) used under the same conditions. Unlabelled sample (Red line) was also used as a control. Flow Cytometry analysis of MCF-7 cells using anti-NFATC1 antibody . Overlay histogram showing MCF-7 cells stained with (Blue line).The cells were blocked with 10% normal goat serum. And then incubated with rabbit anti-NFATC1 Antibody (,1µg/1x106 cells) for 30 min at 20°C. DyLight®488 conjugated goat anti-rabbit IgG (BA1127, 5-10µg/1x106 cells) was used as secondary antibody for 30 minutes at 20°C. Isotype control antibody (Green line) was rabbit IgG (1µg/1x106) used under the same conditions. Unlabelled sample (Red line) was also used as a control. Flow Cytometry analysis of Jurkat cells using anti-NFATC1 antibody . Overlay histogram showing Jurkat cells stained with (Blue line).The cells were blocked with 10% normal goat serum. And then incubated with rabbit anti-NFATC1 Antibody (,1µg/1x106 cells) for 30 min at 20°C. DyLight®488 conjugated goat anti-rabbit IgG (BA1127, 5-10µg/1x106 cells) was used as secondary antibody for 30 minutes at 20°C. Isotype control antibody (Green line) was rabbit IgG (1µg/1x106) used under the same conditions. Unlabelled sample (Red line) was also used as a control. 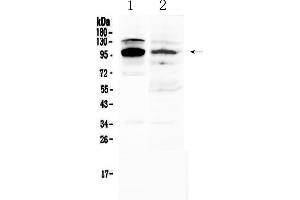 Purpose Rabbit IgG polyclonal antibody for NFAT2 detection. Tested with WB, Direct ELISA in Human,Mouse,Rat. Characteristics Rabbit IgG polyclonal antibody for NFAT2 detection. Tested with WB, Direct ELISA in Human,Mouse,Rat. Immunogen E. coli-derived huamn NFAT2 recombinant protein (Position: Q589-K652). Background NFATC1(Nuclear factor of activated T-cells, cytoplasmic 1), also known as NFATC or NFAT2, is a protein that in humans is encoded by the NFATC1 gene. And it is also a component of the nuclear factor of activated T cells DNA-binding transcription complex. The NFATC1 gene is mapped on 18q23. Proteins belonging to this family of transcription factors play a central role in inducible gene transcription during immune response. NFATC1 was not detected in brain, liver, or kidney. NFATC1 is an inducible nuclear component which functions as a major molecular target for the immunosuppressive drugs such as cyclosporin A. The solution structure of the binary complex formed between the core DNA-binding domain of human NFATC1 and the 12-bp oligonucleotide duplex containing the ARRE2 DNA site from the IL2 promoter. Nfatc1 was expressed exclusively in mouse hair follicle stem cells, and using gain- and loss-of-function approaches, and Nfatc1 inhibited stem cell activation. Application Notes Notes: Tested Species: Species with positive results. Other applications have not been tested. Optimal dilutions should be determined by end users. Boster recommends Enhanced Chemiluminescent Kit with anti-Rabbit IgG (ABIN921124) for Western blot.